An excellent program that can be combined with animated screensaver maker and dp animation maker. After getting used to your static wallpaper, considering and applying an animated one will bring in the much needed life to your computer’s display. To get animated wallpapers, most users turn to the internet. However, I recently discovered Animated Wallpaper Maker which gives you that control you would need to have customized animated wallpapers. You will have it easy when installing this software provided you have Windows Vista, 7, 8, and 10. After installing, you will be greeted with a rather moderated workspace with options distributed on the main window. If you just getting started, the best way to have your first feel of the software is by launching and opening the Example Projects. In so doing, you will have a gist of how to find your way around this wallpaper maker. The learning process should only take a short time. As you are in the process of creating your animated wallpapers, you can check out the progress by previewing them before deciding to go ahead and apply. On clicking the Preview button, it displays the desktop and lets you see how your display will look like. Even during previewing, your desktop icons will still show. After checking out the example projects that come with Animated Wallpaper Maker, you will have it easy when you finally decide to use your own photos. The process is simple as you only need to choose a photo, pick an effect, and add an animation. As a result, you will end up with a personalized wallpaper but with your handpicked animation and effects. To choose a preferred photo for a personalized wallpaper, this program has you covered in terms of the photo file types it supports. You could easily work with JPEG, Bitmap, PNG and TGA files. After all, these are some of the most common photo files you will find around. Animated Wallpaper Maker gives more than just a bunch of useful Effects and Animations. Under animation, you will get to choose the timing scheme and Fade parameter. Such small customization options present a wide range of things you can apply to a wallpaper. 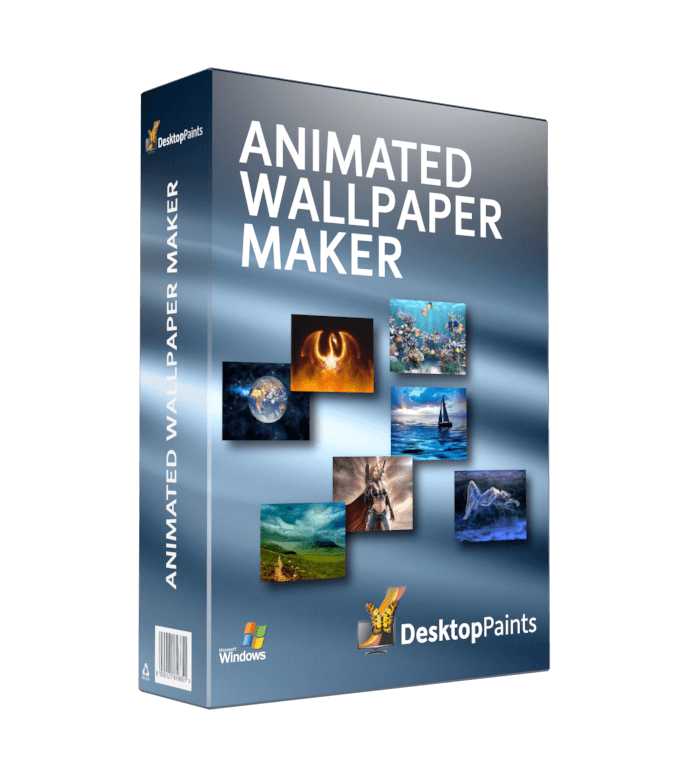 Desktop Paints went an extra mile in developing Animated Wallpaper Maker and ensuring it has as many options as possible. However, to novice users, the options could be too many and overwhelming. As such, I think a small rearrangement of the options on the main window could do more good than hard to this software package. When you want to preview your animated wallpapers, this program will let you do so. However, when transitioning from the preview mode, I experienced occasional lags and a few Windows blue screens, which was a major concern for me after having a smooth experience with the other features. If you want to give your PC display some life, then Animated Wallpaper Maker should be your next stop. This program has a wide range of easy-to-use animation options that will turn your static photos into nice animated wallpapers. The software seems to have bugs especially when it comes to previewing and exiting from the wallpapers you are creating. Animated wallpaper adds some taste to your desktop background. They are a better version of the native slide shows that Windows gives you and the product is always impressive and stunning at the same time. Creating them might not be that easy if you don’t have the right tools. Animated Wallpaper Maker claims to be that tool. Everything looks simple and rather manageable at first glance. You can get the examples to give you an idea of what the tool can do and get the chance to launch your very first project at the click of a button. The creativity kicks in once you have your background in place and are ready to create your masterpiece. Animated Wallpaper Maker didn’t give me that overwhelmingly advanced feel you get from professional video or photo editor. It gets the job done whilst retaining a simplistic look and methodology that will definitely be welcome to beginners and armatures. If you are creative, you can create amazing animated wallpapers without pouring over tutorials to figure out how something is done. The prebundled animations and effects make it way simpler to create your animations. The effects and animations library is where everything comes to life. I’m glad to say that it is as wide as I could ever want it to be. There are tons of effects and brushes that you can use to accomplish impressive wallpapers without breaking any sweat. Couple this with the fact applying a new animation gives you an immediate feedback on the design section and you can see the effects of every tweak you make. Animated wallpapers tend to steal some of your resources and could be quite the bother to underpowered machines. I didn’t see any lag on my computer. I was however concerned by the fact that it consumed around 50MB of RAM (this will vary according to the wallpaper complexity) and a considerable CPU time. While the set as wallpaper straight away isn’t really a bother, the only problem is the fact that the wallpaper will actually consume a considerable amount of your processing power to run. This will be a problem the moment you launch resource intensive apps or if you are deploying it on a laptop, you will be burning battery juice running the wallpaper. A GIF render or short movie could have been perhaps a better way out. Animated Movie maker is an amazing solution to anyone who dreams of making great desktop backgrounds. The fact that you can even pack your background and share it makes even a cooler way to share you creations with friends and the world. You will love the process and won’t take long to get your first publication up and animating. It will not run. It opens. You can load an image. You cannot apply an effect. It crashes the program.